The Care Review is embarking on an exciting Journey to make change happen for infants, children and young people in Scotland who experience being in care. One year on from its launch in May 2017, the Care Review is sharing findings from the Discovery stage and the plans that have emerged from what the Care Review has learned. During Discovery, the Care Review team travelled across Scotland to listen to children, young people, and adults with experience of care. There was lots of interest in Discovery, so much that more time was needed to make sure everyone who wanted to take part could do so. Crucially, this allowed the conversations with care experienced children and young people to be safe and supported, and at a time, place and pace that suited them. Offering children and young people choice in how they shared their voice with the Care Review, was a must and so there was a range of ways to take part to shape the vision and scope of the ‘root and branch’ review. This included face-to-face conversations, events delivered by the 1000 Voices team postcards, social media, and video calls using FaceTime. During Discovery, the Care Review has heard the voices of 854 children, young people and adults who have current or past care experience. 789 members of the paid and unpaid workforce shared their views and all 32 local authorities have engaged in Discovery. In addition to spending time with children and young people, Chair Fiona Duncan has met regularly with children’s charities, organisations and care providers to ensure that they continue to have a significant role in the work of the Care Review. “I want to say a HUGE thank you to everyone who got involved in Discovery, the commitment that people have made to the Care Review has been so inspiring. The Journey stage begins today (1st June) and will run until autumn 2019. In the fourth and final stage – the Destination – the Care Review will make final recommendations, aiming to conclude in spring 2020. While the Discovery stage has come to an end, the Care Review will continue to listen, and the voices of those with lived experience of care will remain at the centre of the work ahead. 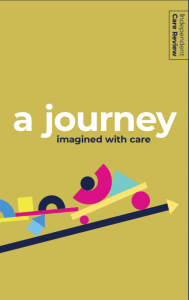 The success of the Journey stage depends on many people working together to understand what must be done to deliver real change for infants, children and young people who experience care. There is a role for everyone in doing this and you can find out more about ways to take part on the get involved page.